They set us loose in something called the Elizabethan Room…A half-hundred old crackpots tiptoeing across the carpet…some woman I don’t know is pinning everyone with name tags. Immediately the ashtrays are full of them, pins bent by palsied fingers. Name tags at the Anarchists’ Convention?…”I read Anarchism and the Will To Love.” My one turkey and she’s read it…I want to eat. I want to go home. I want to cry. As if Hugh Howey needs something to read, right? I found myself during my interview with Howey on Tuesday recommending he read filmmaker and author John Sayles’ hilarious short story At the Anarchists’ Convention. Here’s as close to a perfect reading of it as you may ever get: Jerry Stiller’s masterful Selected Shorts performance. Great to find it at WNYC.org. We’ve earned the laughs of Sayles’ and Stiller’s work after spending the week together rending our garments, as one wag describes it. Howey’s new Author Earnings report (with more than 150 comments so far) went live at about 1 p.m. ET Tuesday and was quickly and admiringly classified as a “bombshell” by the longtime independence-warrior Barry Eisler. Another deeply pedigreed hair-tearer in the cause, Joe Konrath, picked up the large report and posted it for his avid readers to help out when Howey’s new AuthorEarnings.com site was crashed by eager newcomers. They stepped right up, the leadership did. Notice that? Need to catch up to all this? You’re not late, it’s all new. Here’s my A Call for Writers To Organize: Hugh Howey Interview, my Tuesday “Evening Ether” (so Dickenson, no?). It’s an introduction to the AuthorEarnings.com site and project—which has as its goal bringing together a creative community easily as diverse as Sayles’ anarchists’ convention. 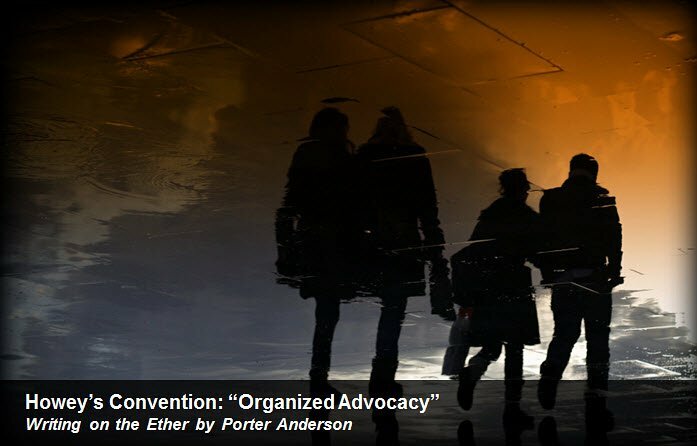 Authors have suffered from a lack of organized advocacy. Trying to organize the entrepreneurial firmament? —so many levels and layers of digitally leveraged motivation, ego, aspiration, experience, professionalism, amateurism, talent, skill, opinion, temperament, goals, and roles? That may be much more challenging than this week’s slugfest over data nobody actually has—this publishing phantasm with which so many are wrestling so bravely. And yet, that’s the goal. That’s the prize on which certain energetic eyes are locked. The questions we want to ask, as authors decide how they want to publish to maximize their chances of making a career is: Should authors worry about giving up bookstore sales by self-publishing? Or should they worry about giving up their digital rights if they sign with a major publisher? If I was just getting started, and I absolutely did not want to self-publish, I would at least hold on to my manuscript until the dust settled. I would write my second and third book. I would wait for digital royalties to lock in at 50% of net. And I would be sure that my foreign rights were valued appropriately, especially for e-books. One of the defining moments of my writing career was the day I sat in a board room of one of the mightiest publishers in the world and had to weigh the decision whether to sign my work over to a major publisher. When asked how awesome it would feel to tell people that I was now with such an august house as this, I realized that I would need to be compensated for giving up the right of saying that I was self-published. I admitted that such an honor would cost the publisher dearly. This is Howey in a brand-new video, just posted to his site on Wednesday evening as a timely follow-up, he points out, to the launch of AuthorEarnings.com. In this appearance, he’s doing something he frequently does—he’s showing his readers who visit his site a new book. He also has written the foreword. It’s called “Indie and Proud.” He reads from it in this video. When I read indie fiction,…authenticity oozes from the page. I encounter styles and genres I didn’t know existed. I hear voices that are alien to me. Now, you might want to shout that when you read traditionally published fiction, you experience, or have experienced, all these things, too, right? Me, too. Hell, you may feel this is corny stuff: here’s the upstart writer, you say—never mind the two million copies he’s sold so far of his books—sitting at his computer, reading his indie-pride soliloquy to his camera. Bella the boxer is probably just behind his chair, as usual, snoozing. Everybody’s a critic. But someone is listening. It got more than 200 views overnight. That’s the kind of number that may, actually, count here. More than the estimates-of-estimates modeled on assumptions of assumptions. More than the voluntary input of the faithful on self-selecting surveys. The numbers that will increasingly count, with fast-rising impact on publishing, are found in the tickers on authors’ YouTube videos and in comment counters that race up—by the hundred on the Kindle Boards—when the anarchists convene to debate a single topic. There’s no shame in producing your own material. And breaking the rules. And writing along the edge of convention and between the boundaries of genre. There’s nothing but honor there. I’ve watched a good bit of scoffing go on, most of it measured and respectful, particularly among industry pundits, in the first 36 hours or so since Howey’s “bombshell,” the AuthorsEarnings.com site went live with its survey, its petition, and Howey’s controversial report on new sales estimates based on Amazon rankings. I don’t begrudge how anyone publishes, but for me, the advantages of being independent far outweigh the disadvantages. I own my work. I write what I want. I have a direct relationship with my readers. Howey as a reader? Where’s Stiller when we need him? We just released our first report on AuthorEarnings.com…There’s been a lot vitriol…that’s actually a good sign. Quite a few people have pointed this out, that a lot of what’s being said about independent publishing is validating. It’s something that industry veterans are even discussing it instead of dismissing it…The anxiety we see is a sign that the changes are noticeable and things are being felt…I see the consternation as a good sign. Good attitude. Good thing, too, because there’s plenty of consternation available, all you can eat. “Full of misinformation,” charges one critic on a private industry email listserv. “The loose use of numbers in the Howey piece made me shudder,” writes another. Never mind that Howey has a contract with Simon & Schuster. He is on a second contract with Random House’s Century in the UK. And he’s some 10 years into his writing career. Nevertheless, this last complaint is among those you hear most frequently: Howey doesn’t understand the business of publishing. Indeed, several themes that frequently arise in criticism of this author’s activism are amplified in reactions to the Author Earnings initiative. Howey is said by others to be likely to reify bogus assumptions found in, or based on, the Author Earnings material—by stating them, in other words, to make them live as truth, being passed as gospel from one person to the next. By policy, I won’t be naming here the industry observers who are painstakingly discussing the work on this listserv. I count some 55 messages in one chain. But I should assure you that there are supporters in that particular conversation, as well. One proponent writes: “What Hugh did for the US, Matthias Matting is already doing” in Germany, where the journalist and author’s Die Self-Publisher Bibel is tracking sales/ranking estimates of the Amazon.de Kindle Top-1000. Here is how it was discovered that on a day late in January, the Top-10 Kindle sellers in Germany were all self-published. And to think I was referring to the self-publishing world as our new anarchists’ convention. Not everyone has the kind of training and expertise I bring to this type of research with my doctorate and years of research and teaching. What I would like to do here is take a closer look at Howey’s numbers, which he graciously provided in the raw, explain the limits, and provide you with more informed conclusions based on the statistics using widely accepted research and analysis techniques. I wrote about Weinberg’s affecting DBW Conference presentation on the Ether in Is the Publishers’ Monopoly Broken? The question there is hers, by the way, and is posed in earnest. Weinberg is an author, herself, both traditionally (in nonfiction) and self-published (in a new fiction series). Howey’s numbers provide the clamored-for corrective of focusing on the successes, rather than on the broad spectrum of authors we have in our survey. Rather than interview authors or rely on a self-selecting group of survey respondents, Howey selected his sample based on sales-ranking success. He captured the Amazon rankings data for Kindle ebooks in the top-selling fiction genres of romance, sci-fi/fantasy, and mystery/thriller. His sample consists of a snapshot of nearly 7,000 ebooks (6,887 books in the data I downloaded). She’s responding, of course, to Howey’s own charge, in which he was joined by many, that the DBW-WD survey had compared the earnings of only successful (thus published) traditionally produced authors responding, while factoring in the entire range of sales (so many of which are less happy) by self-publishers. That one we covered in December, in Where Publishing Surveys Cannot Go. Howey has shouted foul for my…analytic decision not to include unconfirmed zeroes in my analysis of income or to swap authors in and out of categories without clarity on where they belonged. So why didn’t he do it when given the chance? As we refine our analysis of this data in the coming days and weeks, we’ll find out I’m sure. And in what I perceive to be the main message of her response, she suggests common cause. While the Author Earnings sample examines the high end of earners, the results are depressingly consistent with the findings I’ve reported from the Digital Book World and Writer’s Digest Author Surveys for 2013 and 2014: While a few authors are making money from their writing, not that many authors make that much money. Authors and publishers face a hard market, and it’s not easy to sell a lot of books. Publishing is a segmented market. A very small percentage of authors are in a position to support themselves with their writing, no matter which publishing route they’ve chosen. Publishers don’t have a lock on the answers, and the contributions they make to author sales and income are increasingly in question, leading to calls for partnerships that provide greater benefit to authors. Self-publishing is making it easier than ever before for more authors to make at least some money, if not a lot of money, on their writing, but these authors are a small percentage of the whole. The Report – Author Earnings http://t.co/o8C0V0Gr5C <- This is worth a day of your time. In preparing for the inaugural London Author Fair event at the Hospital Club in Covent Garden on February 28, I asked producer Gareth Howard of Authoright how he came to use that bit of labor-unrest-ish artwork and the phrase Writers Unite in his graphics for the rollout of this new series of author-facing events. You’re right it is intended to embody an entrepreneurial spirit. Although my jumping off point with it was nearer to Marx (ironically) with the idea of Schreiber aller Länder vereinigt Euch! And I suppose the logo reflects that, it’s a positive call to arms for authors. What I’m looking for in asking him about this is some insight into why new events for authors of this kind are turning up. The need, and the commercial opportunity, of course, are there. And so is the sense of timing that’s evidently spurring Howey’s new move with Author Earnings. Effectively writers have been the workforce and have not been, arguably, as fairly rewarded as they should. Before the present deconstruction of the industry, democratization through self-publishing, authors like me 10 years ago were turned away and told to forget about writing. 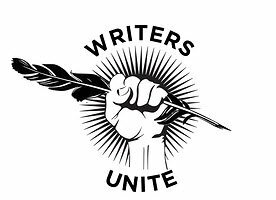 But writers are, or should be, one of if not the driving force of the industry. And by uniting, they can become their own power, generate their own ideas and shape the industry that sells their creativity. It also reflects the new idea of authors of all levels of achievement banding together, whereas before there was a gulf between bestsellers and everyone else. And what’s cool with the indie authors, is that everyone is in it together. So someone like Hugh Howey, who is creatively and commercially very successful, has been calling for change and better royalties, but to my knowledge JK Rowling or other authors that have been allowed through the ‘gates’ have not. And there you have it. Howard is seeing both the moment for unity and the vast diversity of the field. Of course the data is important. Weinberg gives us “The data are the data.” I’m good with that, Dana. But especially considering the fact that we don’t have the actual data we need to clearly perceive and parse what’s going on in publishing—as long as the major retailers feel they must withhold the numbers we need, as long as so many self-publishers feel they can’t use the identifiers we need to track their work—then shall we not look beyond these Battles of the Extrapolations to what really is afoot here? You may be looking at the best chance ever encountered for authors—of all stripes, Ms. Rowling, as Howey tells us—to at last come together, to make common cause, and to speak as one with a force this industry has never known. If the PDF cookbook-maker in Ipswitch can get together with the Wattpad scribbler in Omaha and the Smashwords-churner in Pasadena and the Kobo Writing Life mystery-spinner in Dijon and the Amazonian multiple bestseller in Jupiter, Florida, that anarchists’ convention hotel may not survive the event. But the industry! the industry! will be under new management. Meet these bestselling charter members of BookExpo America’s all-new center for entrepreneurial authors. Clockwise from upper left: Bella Andre, Barbara Freethy, CJ Lyons and Hugh Howey. Join them in networking with industry players on the trade show floor. Basic membership includes your BEA badge, uPublishU Conference access, the New Title Showcase, BEA Show Planner, and Mobile App listings. Premium membership adds a dedicated meeting table and chairs in the Hub and a BEA Autograph Signing session. Posted in Writing on the Ether and tagged Amazon, author earnings, Dana Beth Weinberg, entrepreneurial author, Gareth Howard, self-publishing, Writer's Digest. Right, Joseph. 🙂 Working my way up backward on comments, thanks for yours. Hey, Jim, thanks for all this input — and nice comment on AuthorEarnings.com’s report, too. And this is a very succinct set of responses to Dana Weinberg’s four points in her post-AE piece. Thanks for these, I’ll stop here and tweet a bit of this for our readers to see. Pack a lunch, indeed! Seems like ages ago, though it was only the top of your column, that I read about The Anarchist’s Convention. Thanks for the reminder. I loved it when I first read it, often used it with students, and intend to take it off my shelf to read again. Sayles was a great short story writer. Mary, good to hear from you and thanks so much for the input. I’m glad you’re a Sayles fan, too. And yes, we are into one anarchic energy now — which could be the healthiest struggle the industry has faced yet. Unfortunately, the sample size of one day is statistically invalid. Just as your personal situation is statistically invalid. And that is the greatest flaw with this dataset–it does not mean anything. I have both been traditional published and I am firmly in the self publishing camp, but I don’t see anything useful in this data except for what happened on that day. Hi, William, and thanks for the comment. Indeed, the extrapolation to a year from a day’s data estimates is one of the most frequently heard misgivings about this first report from the AuthorEarnings.com project — I’m sure it’s therefore one of the main elements that Howey and his codester are addressing in future reports. Quite right. While a snapshot of one day is quite possibly a statistical anomaly, what doesn’t change is the percentage that the Big 5 publishers take from ebooks. It’s the single, most important reason those publishers had a banner year last year. Yet, they continue to spout ridiculous, unsubstantiated claims about paper sales and the dwindling percentage of ebooks. Excuse me, but the Emperor is naked.